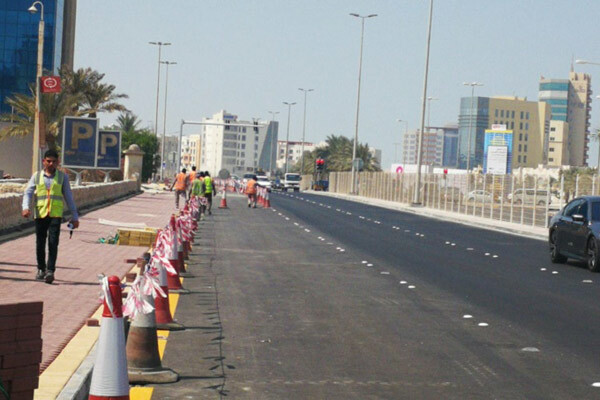 Bahraini authorities said they have completed the work on Nasser Bin Jabr Al Jabr Avenue Expansion project in Seef District of the kingdom. The project involved the construction of an additional lane, running 1.25 km long, to ease incoming traffic from the west of Street 40 to King Abdullah II Ibn Al Hussain Avenue, said a statement from Bahrain's Ministry of Works, Municipalities Affairs and Urban Planning. It also included development of the rainwater drainage system and reconstruction of sidewalks for pedestrians besides modernisation of streetlighting, replacement of old lighting poles with new ones to cover the new lane. It also saw the installation of suspended traffic signs and the necessary instruction billboards to achieve the required safety and security on the road, and installation of safety barrier wherever required, said the statement. The ministry said the project will help reduce the traffic congestions in Seef District due to increased urbanisation and economic boom witnessed at the commercial malls. The daily traffic volume on this street is currently 10,000 vehicles per hour heading west. At peak hours, it surges to more than 3,000 vehicles per hour and reaches 5,200 vehicles per hour in the afternoon. It also ranges from 5,100 to 5,800 vehicles per hour at its peak in the evening, it stated. The expansion project will boost the intake capacity at the western entrance of the Street 40 to 2,000 vehicles per hour which will improve the traffic flow and reduce waiting time on the Seef Bridge’s Intersection. On the other side, the intake capacity of Nasser Bin Jabr Al Jabr Street Intersection with Road 2827 will increase by 36 per cent whereas the intersection will operate at highest efficiency, said the statement from the ministry. The King Abdullah II Ibn Al Hussain Avenue’s intersection with Nasser Al Jabr Street will increase the intake capacity by 14 per cent where the waiting queues reach nearby intersections. According to the ministry, the entire project has been implemented within a short duration as part of Bahrain’s comprehensive road network expansion plan commensurate with the urban expansion and increasing vehicle numbers.